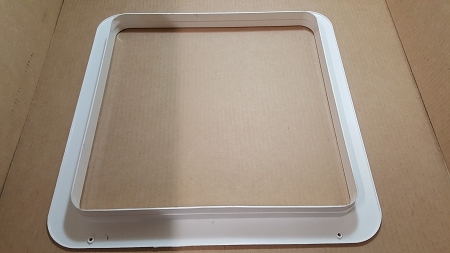 This plastic garnish ring is inserted from the bottom of the installed vent, fits inside the vent & finishes the look on the ceiling of the RV or trailer. Color is a light cream/ white. Installs with four # 8 sheet metal screws. the four screws are already included. Choose 1 1/4" if your roof is the distance between the metal flange & the interior roof ceiling is 3/4"- 1/14". Choose 2 1/4" if your roof is the distance between the metal flange & the interior roof ceiling is 2"- 3".